Sotheby’s offers for sale Part II of the Stuart Cary Welch Collection: Arts of India, on May 31, 2011, This follows the outstanding total of £20.9 million achieved last month for Part I of the Stuart Cary Welch Collection Arts of the Islamic World which established an auction record for any Islamic work of art and set a record for any single auction of Islamic Art. The 204 -lot sale, which will take place in London on Tuesday, May 31, 2011, will comprise many dramatic and exquisite works of great rarity, including Rajput, Deccani, later Mughal, Company School and Himalayan paintings, drawings and works of art, as well as a wide range of more affordable drawings, sketches and decorative arts from the 13th to the 20th century. Mewar, Udaipur, circa 1700. Opaque watercolour on paper, red border, reverse with inscription in Devanagari, 48 by 58.4cm. (19 by 23in.). Estimate: 70,000 – 90,000 GBP. Photo: Sotheby’s. Headlining the auction will be an exquisite Vasudhara Mandala, the earliest recorded Nepalese paubha that contains a date within its dedicatory inscription, and was painted in 1365 by Jasaraja Jirili. While nothing is known of the artist mentioned in the inscription, his work remains one of the finest and most important of the relatively small corpus of early Buddhist and Hindu paintings from the Kathmandu valley. The overall format is typical for Newar painting with the inclusion of ritual scenes and portraits of the painting’s donors below. The Buddhist goddess Vasudhara is worshipped in Nepal as bestower of prosperity, and is depicted at the centre of the painting holding emblems of wealth and abundance and symbols of the Buddhist faith. This sublime example was painted during the reign of the Nepalese Malla king Jayarjunadeva (r.1361-1382) and remains a document to the artistic genius that made Newar artists famed and sought-after throughout the Himalayan region, and as far afield as the Chinese imperial courts of the Yuan, Ming and Qing dynasties. It is estimated at £300,000-400,000. One of the auction highlights will be a Monumental Portrait of a Monkey, Mewar, Udaipur, circa 1700, which is estimated at £70,000-90,000. This large, imposing and very finely painted portrait of a monkey is a rare and important work. The quality of the painting is exceptional, especially the face, which combines monumentality and extremely fine execution to great effect. 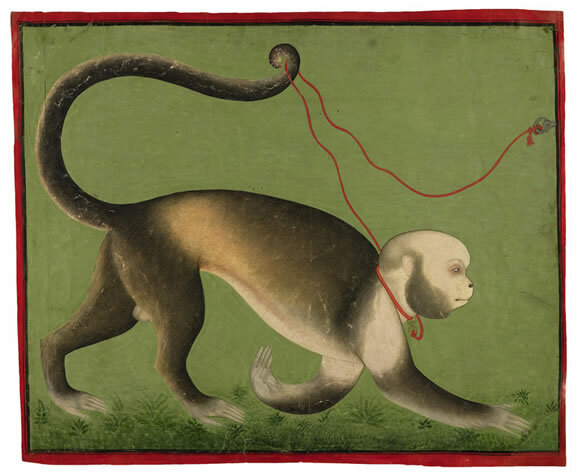 The monkey is clearly a pet – the red rope harnesses the animal to a metal ring, and the portrait is highly unusual in the context of Mewar painting. An interesting inscription on the reverse indicates that the monkey was presented by a Muslim nobleman, providing a very unusual and intriguing piece of information. A further work is Radha and Krishna in a Bower: A folio from the Gita Govinda, attributable to a master of the first generation after Nainsukh, Pahari, Kangra or Guler, circa 1780. This lyrical illustration (opaque watercolour heightened with gold on paper) is from one of the best-known and most aesthetically harmonious series in Indian painting. Composed as a homage to Krishna, the Gita Govinda (Song of the Dark Lord), written by the 12th century poet Jayadeva, is an evocative description of the courtship and love between Krishna and Radha. It is estimated at £60,000-80,000. Bhairavi Raga: Lord Krishna Enthroned and Adored, an illustration from a Ragamala series, Deccan, Aurangabad, or Rajasthan, Mewar, circa 1650, is an additional highlight and is estimated at £30,000-50,000. This is a rich and vibrant miniature from an important and widely debated Ragamala series. A further work of importance in the sale is a rare example of early Pahari painting, from Basohli, circa 1670-1690. The lyrical miniature depicts a lady and her companion listening to musicians, while admiring a bird. The work is estimated at£15,000-25,000. Celebrating Holi, Awadh, circa 1760-1764, formerly in the collection of Dr William Fullarton, is estimated at £30,000-40,000. This powerful painting with an extraordinary wealth of detail presents an image of the Holi festival that erupts with springlike vigour and energy. It is also one of the largest and most important miniatures from the provincial Mughal schools of the second half of the 18th century. It was in the possession of Dr William Fullarton, the Scottish surgeon in the East India Company, stationed in Bengal an Bihar from 1744 to 1766, who was well-known for his patronage and collecting of Indian painting. A famous portrait of Fullarton seated on a terrace smoking a huqqa is in the Victoria and Albert Museum, London. Entertainment in a Harem Garden, signed by Faizullah, Faizabad, circa 1765, is a panorama of the courtyards and gardens of a large and complex palace. It is one of the greatest late Mughal paintings and is estimated at £40,000-60,000. The main scene shows a princess with female attendants and musicians on a terrace watching a dancer skillfully balancing flasks of perfume, but the most impressive aspect of the work is the brilliant cascading depiction of the palace and gardens. A celebrated connoisseur and collector, Stuart Cary Welch was also a curator, scholar and gifted teacher. His contribution for over half a century to the study of the art and aesthetics of India and the Middle East was second to none. Through his innate understanding and intense feeling for Indian and Islamic art, especially painting and drawing, he was able to enlighten and lead others towards a richer and deeper appreciation of the subject. Testament to his infectious enthusiasm for artistic beauty and to his inspirational gifts as a teacher is the distinguished role call of students and friends who went on to become scholars, collectors, curators and museum directors in their own right. Stuart Cary Welch’s career as a lecturer at Harvard (1960-1995) was complemented by his role as curator of Islamic and Indian Art at Harvard Art Museums spanning over forty years. His remarkable eye and his ability to marshal artistic and didactic themes were seen in the pioneering and rightly admired exhibitions that he organised and curated. These groundbreaking exhibitions revealed a whole new and exotic world of art to the public in America and Europe. Stuart Cary Welch’s donations have given institutions outstanding additions to their permanent collections.